How to change your Pro subscription? To change your Iconfinder Pro membership to another one with more or less downloads, please follow the steps in this article. The result of changing to another subscription plan is that you will roll over more or less downloads, depending on the plan you choose. Also, you might change your billing between monthly and annual too. 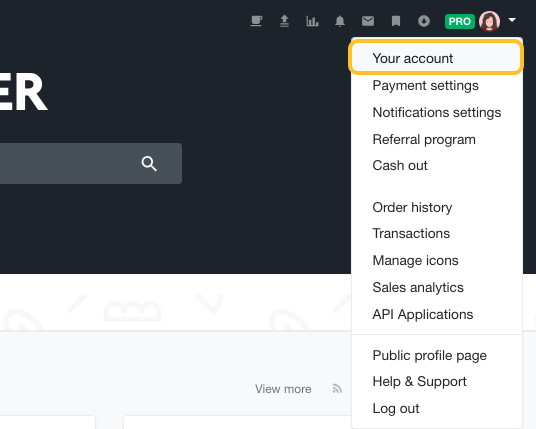 Log in to your account and go to Your account page by clicking on your avatar and choosing Your account from the dropdown menu. To change your subscription plan, select the desired option as below. The current option is highlighted in blue, as in the screenshot below. You can choose between Pro Micro, Pro Starter and Pro Unlimited subscription plans and, for each of those options, choose Monthly billing or Annual billing (billing refers to when the payments are made). ❗ Note: You will need to confirm changes in your subscription plan before these become effective. You will be able to see when your next billing will happen and the amount in USD, as a confirmation. If you switch from Pro Micro to Pro Starter, you will receive 40 downloads to use right away. Next month, if you have not used all the downloads, they will be rolled over, along with 50 fresh downloads. ❗ Note that the maximum roll-over for Pro Micro is 60 downloads. For Pro Starter, it is 300 downloads.